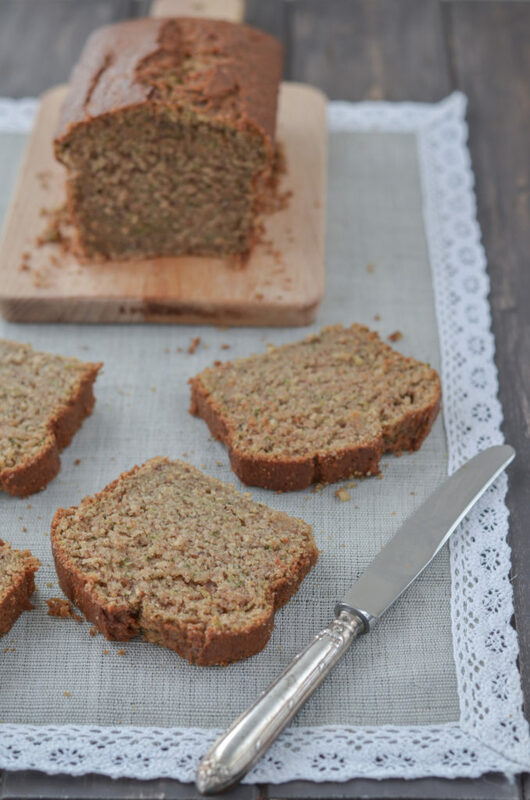 So, I have just finished the perfect recipe for delicious zucchini bread with ground hazelnuts and gingerbread spices, which contains less fat and sugar than in the classic recipes. You will love it – I promise! 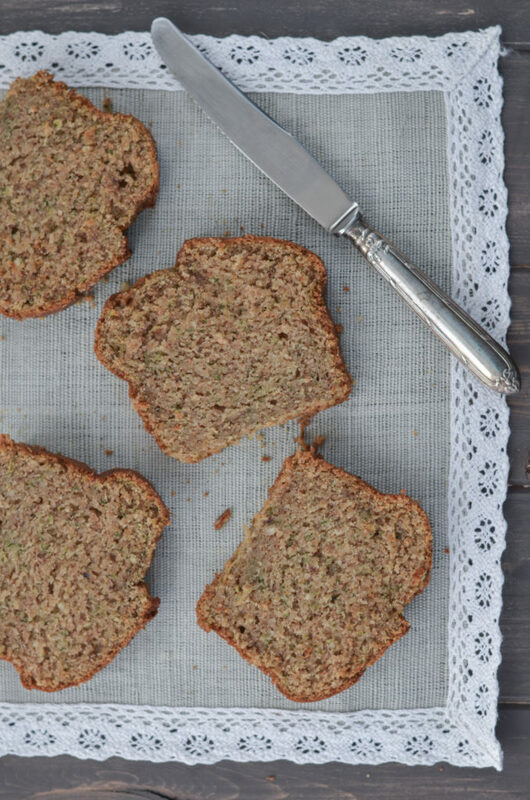 Thanks to the grated zucchini, the bread is moist and smooth and thanks to the ground hazelnuts and applesauce it melts in your mouth. 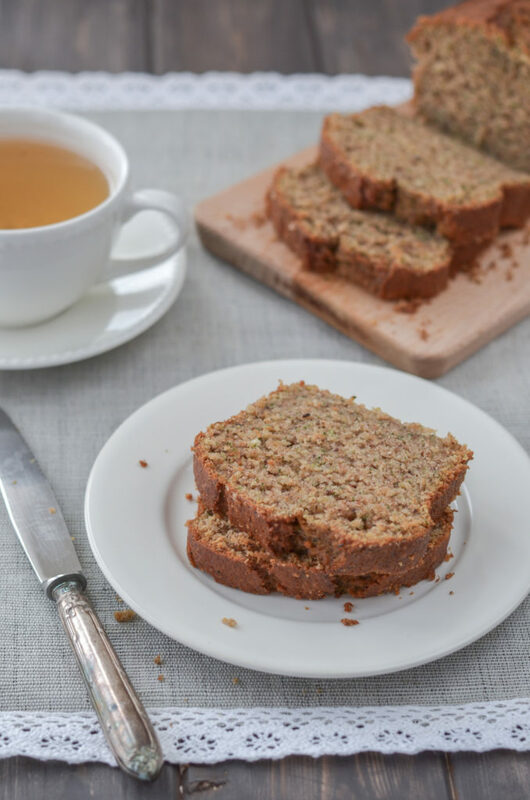 In addition, this zucchini bread is very aromatic because I used a mixture of spices – the same one that I use to make gingerbread. 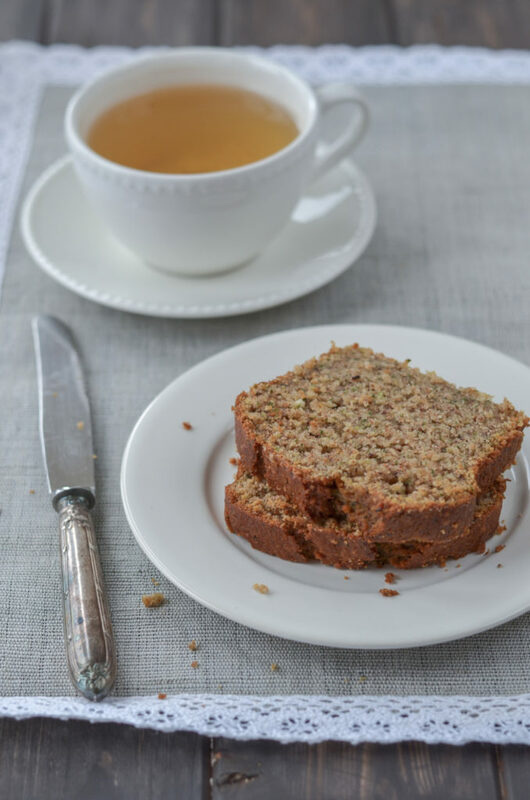 The whole story of searching for the perfect recipe for zucchini bread started 2 years ago when I visited Champagne in France for the first time. We stayed at a charming bed and breakfast (oh, how I love those bed & breakfast places in France!). The breakfast was like in heaven – we had everything: fresh croissants, homemade jams and yogurts, fresh baguette, cheese from the region, fruit from the garden, and a secret ingredient cake. The lady first let us try and only then we could guess what kind of cake it was. She said that not many people really see that this is a zucchini cake. I remembered that moist and smooth texture of the cake and also the fact it contained ground nuts. It took me a few months to find a similar recipe that I liked, I tried a few recipes but I always changed something. I wanted to make it using less oil than it is usually indicated in similar recipes, also with less sugar, and so I added the applesauce. I used half whole wheat flour and half white flour so that people who are not fans of whole wheat flour can enjoy it too. Instead of cinnamon and nutmeg, I used a much complex mixture of gingerbread spices. After a few trials, this is the end result which I am quite happy with! 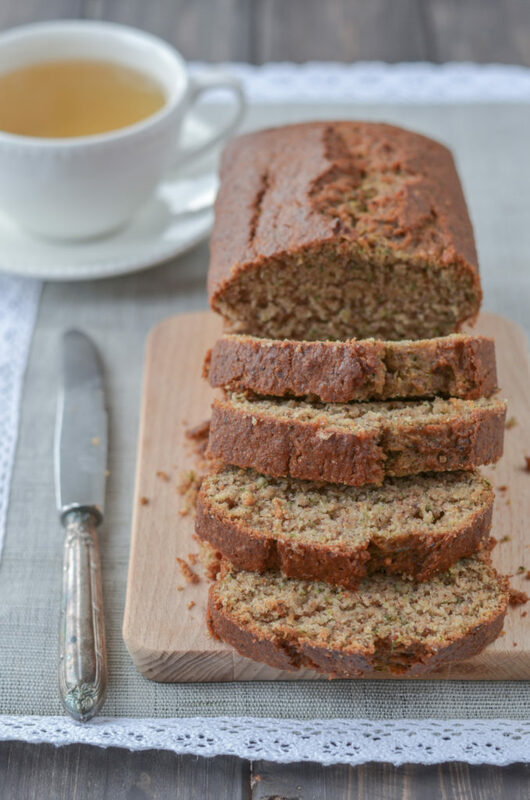 A delicious zucchini breach with ground nuts and gingerbread spices, which contains less fat and sugar than in the classic recipes. You will love it! Preheat the oven to 180°C. Grease and flour the cake pan or use the parchment paper. Drain the grated zucchini in a colander, then wring the remaining water out by your hands. Sift together both types of flour, baking powder, baking soda, salt and the spices. Add the ground hazelnuts. In a large bowl, beat the eggs with sugar until light and fluffy, add the oil, applesauce and rum. Mix all together until smooth, then add the dry ingredients. Stir in the grated and drained zucchini. Pour the mixture in the cake pan and bake for about 45-60 minutes, doing the toothpick test. 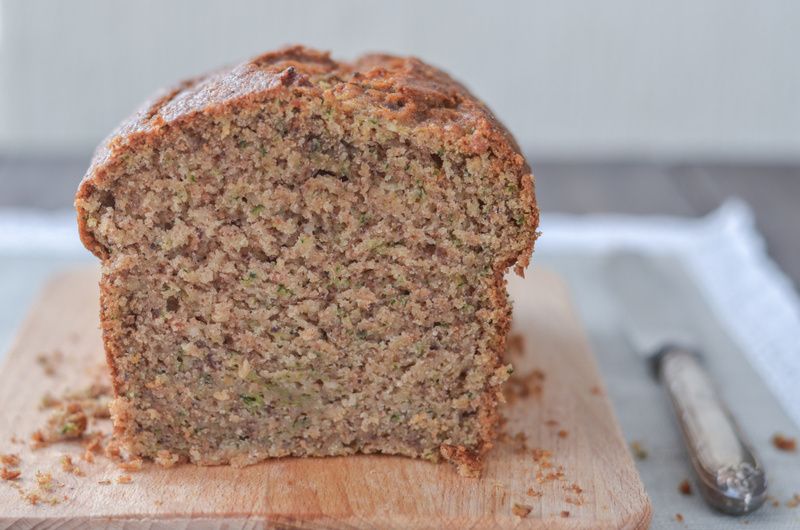 Remember: to avoid overmoist cake, be sure to get rid of the water from the grated zucchini, before adding it into the cake mixture.